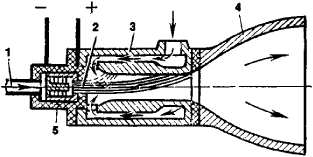 A rocket engine in which the propellant is accelerated by some electric device. Also known as electric propulsion system; electric rocket. (also electric propulsion system), a rocket engine in which electric energy from a power system aboard a spacecraft—usually solar batteries or storage batteries—is used as the power source for producing thrust. The advantage of electric engines is their high specific impulse, which is due to the high exhaust velocity of the propellant; the exhaust velocity may be as high as 10–100 km/sec. The specific impulse of electric engines is many times greater than that of chemical rocket engines, for which the exhaust velocity is not higher than 4.5 km/sec. According to their operating principle, electric engines are classified as electrothermal propulsion engines, electrostatic propulsion engines, or electromagnetic propulsion engines. Electrostatic propulsion engines include ion engines and colloid thrusters; electromagnetic propulsion engines are also known as plasma engines. In electrothermal propulsion engines, electric energy is used to heat a propellant in order to convert it into a gas with a temperature of 1000°–5000°K. As the gas discharges from a jet nozzle, which is similar to the nozzle of a chemical rocket engine, it produces thrust. Substances with a low molecular weight—for example, hydrogen, ammonia, or hydrazine—are used as propellants. The propellant may be heated by means of surface heaters (Figure 1), an electric arc (Figure 2), or—in experimental engines—a high-frequency electromagnetic field. For electrothermal propulsion engines, the specific impulse is 1.5–10 kilonewton-seconds per kg (kN · sec/kg), the thrust density (the ratio of thrust to discharge area) is 0.3–3 meganewtons per m2, and the thrust duration ranges from several hours to a few hundred hours. In ion engines, the propellant is ionized and the ions and electrons are accelerated separately in an electrostatic field by means of a system of electrodes. Subsequently, the ions and electrons are mixed together for space-charge neutralization and are then discharged to produce thrust (Figure 3). A distinction is made between surface-ionization and electron-bombardment ion engines. Cesium, which is readily ionized, is used as the propellant in surface-ionization ion engines. In electron-bombardment ion engines, the propellant may be any substance with a high atomic mass, such as bismuth. In colloid thrusters, charged microscopic droplets are accelerated rather than ions. The droplets may be charged, for example, as a result of the contact potential difference that arises when droplets are removed from the surface of an electrode. For a current density of several milliamperes per cm2, the accelerating potential is about 10–20 kilovolts (kV) for colloid thrusters and 2–7 kV for ion engines. For both types of electrostatic propulsion engines, the specific impulse is 15–100 kN · sec/kg, the thrust density is 30–50 newtons per m2 (N/m2), and the thrust duration is one or more years. In electromagnetic propulsion engines, the propellant is a plasma of any substance. The plasma is accelerated owing to the electromotive force in crossed electric and magnetic fields. A distinction is made between electromagnetic propulsion engines with an external magnetic field and those with a self-magnetic field. Plasma engines with an external magnetic field include classical E × H plasma accelerators and Hall accelerators, which are of the closed-drift type. In plasma engines with a self-magnetic field, the magnetic field is produced by a current flowing in the accelerated plasma; such engines are subdivided into electropulse and steady-flow engines. 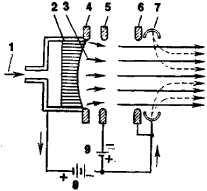 The working cycle of an electropulse plasma engine corresponds to the period when the propellant, usually a fluoroplastic, experiences electrical breakdown; during this period, thrust is produced. The initial breakdown potential is several kilovolts, the specific impulse is 40–100 kN · sec/kg, the thrust density is 10–9–10–8 N/m2, and the number of cycles may be as high as a million. In steady-flow plasma engines, a current amounting to tens of kiloamperes at a voltage of tens of volts is passed through the propellant to produce a strong magnetic field. The specific impulse is 30–50 kN·sec/kg, the thrust density is several kilonewtons per m2, and the thrust duration is tens of hours. The various types of plasma engines and methods of producing a plasma are discussed in PLASMA ACCELERATORS. The limited use of electric engines is associated with the need for a high consumption of electric power (10–100 kilowatts per newton of thrust). Owing to both the presence of an on-board power system, together with other auxiliary systems, and the low thrust density, spacecraft propelled by electric engines have a low acceleration. Therefore, electric engines may be used only in spacecraft that operate either in weak gravity fields or in planetary orbits. Such engines are used for attitude control, orbital corrections, and other operations that do not require a high power expenditure. Ion engines, Hall plasma engines, and certain other electric engines are regarded as promising candidates for the main engines of spacecraft. Owing to the small amount of propellant ejected, the continuous operating time of such engines will be measured in months or years. The use of electric engines instead of existing chemical rocket engines will make it possible to increase the pay-loads of spacecraft. The idea of using electric energy to produce thrust was first proposed by K. E. Tsiolkovskii and other pioneers in space exploration. In 1916 and 1917, R. Goddard (USA) experimentally confirmed the feasibility of this idea. Between 1929 and 1933, V. P. Glushko (USSR) developed an experimental electric engine. In the USSR, electropulse plasma engines were tested in Zond spacecraft in 1964. Between 1966 and 1971, ion engines were tested in Iantar’ spacecraft. Steady-flow plasma engines were tested in Meteor spacecraft in 1972. Beginning in 1964, various types of electric engines were tested in the USA. Early tests were carried out in ballistic flights. Later tests were performed in space flights using such spacecraft as ATS (applications technology satellites) and the SERT 2 satellite. Research in electric engines is also carried out in Great Britain, France, the Federal Republic of Germany, and Japan. Gil’zin, K. A. Elektricheskie mezhplanetnye korabli, 2nd ed. Moscow, 1970. Gurov, A. F., D. D. Sevruk, and D. N. Surnov. Konstruktsiia i raschet na prochnost’ kosmicheskikh elektroraketnykh dvigatelei. Moscow, 1970. Favorskii, O. N., V. V. Fishgoit, and E. I. Iantovskii. Osnovy teorii kosmicheskikh elektroreaktivnykh dvigatel’nykh ustanovok. Moscow, 1970. Grishin, S. D., L. V. Leskov, and N. P. Kozlov. Eleklricheskie raketnye dvigateli. Moscow, 1975. Earlier this month, Volvo said from 2019 they would only be producing cars with an electric engine - either all electric or petrol or diesel hybrid. Scania will supply three-axle distribution trucks with a gross weight of 27 tonnes, where the internal combustion engine in the powertrain will be replaced by an electric engine powered by electricity from fuel cells and hydrogen gas on board the vehicle. A fully charged electric engine will take you up to 30 miles before the diesel kicks in seamlessly. The train, pulled by an electric engine, was crossing the Tamagawa River when the incident happened. It boasts a 400 horsepower electric engine and carbon fiber panels. It introduces a new friend, Stafford, the electric engine, as well as returning favourites Gordon, Flynn, Spencer and Ol' Wheezey. The latter automatically switches between the diesel engine and the electric motor to optimise fuel consumption - using the electric engine at speeds up to 40mph and can switch to four-wheel drive and both power sources for muddy conditions or snow. They hope to pitch their state-of-the-art electric engine design to executives at a major company. The 2011 Chevy Volt is so unique because of the layout of the Voltec drivetrain, with an electric engine driving the wheels while an on-board generator (they call it a range extender) keeps the electric system powered up. It also insists on indication displays showing a silent electric engine is on and safety preventing electric vehicles moving when being recharged. The wholesaler installed an electric engine and gearbox into a diesel wagon that had reached the end of its working life.